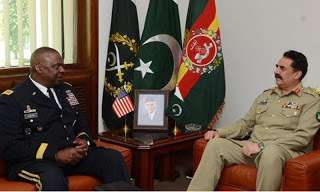 Truth by Kbaig: Indian Propaganda against General Raheel Shareef! Indian Propaganda against General Raheel Shareef! Neither there is dictatorship in Pakistan nor is country in the control of Chief of Army Staff. Despite of this, the criticism of Indian media over General Raheel is not only astonishing but against the diplomatic values. Indian media is of the view that General Raheel Shareef is threat to India while India has not threat from Prime Minister of Pakistan. Not only Electronic, Print media is also busy in propaganda against General Raheel Shareef. 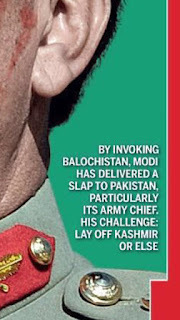 Indian weekly “India Today” having readership out of India in Western countries as well, has published such a picture on its title page on 05 September 2016 edition which maybe termed as slap on the journalistic values and freedom of speech. 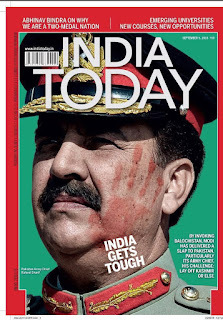 With the title of “India Gets Tough”, the blood stained sign of hand over the face of General Raheel Shareef has been published with the statement that any misadventure of India would be dealt with ironic hands. During the Chief-hood of General Raheel Shareef neither any war has been waged between India-Pakistan nor has Pak-army been deployed to the border in aggressive manners. Why Indian media is busy in such cheap propaganda tactics. General Raheel Shareef is not respected within the country but out of the country as well. 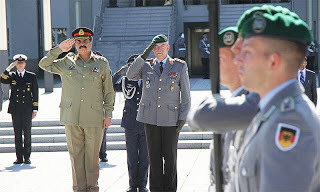 The reason of this respect is that by taking charge as Chief of Army Staff, Raheel Shareef not only waged war against terrorists but declared that terrorists would be destroyed at all costs. Under the “Operation Zarb-e-Azb” Pakistan army destroyed all the terrorist hideouts in the narrow passes of Pak-Afghan border where even British army feared to go. In the past, General Kiyani did not order army to start operation in these narrow pass areas because huge losses were expected in these narrow valleys while on the other hand as a reaction from terrorists it was expected that they will target urban areas of Pakistan. However, General Raheel Shareef decided that enough is enough. Now terrorists cannot be spared anymore to play with the integrity of Pakistan. When General Raheel Shareef announced his decision to end terrorists; its pain was felt across the border in New Delhi and Kabul. This was the reaction over the success achieved by Pakistan army in the initial stages of the Zarb-e-Azb that Special Advisor of Modi, Ajit Kumar Doval had to publish his interview through social media in which he discussed Indian links with TTP, economical problems of Pakistan and Indian role in political chaos in Pakistan. The goal of this video was to demoralize Pakistan army and make Pakistani army hopeless. Along with this innocent students were targeted in schools and universities of Pakistan and Indian policy was announced that Pakistan would be targeted where Pakistanis will feel most pain. Obviously there is no big pain than attack and deaths of children. Pakistani nation bore this tragedy patiently and stood side by side of Pak army in the war against terrorism. After clearing tribal areas from terrorists, General Raheel Shareef ordered to clear rest of the country from terrorists and their facilitators, which was to be done only in Pakistan as well. India has no need to get angry over it. Moreover, the operation against Indian trained terrorists in Karachi, target killers, extortionists, acts against Indian armed interference in Balochistan etc. all are the internal issues of Pakistan and inevitable for integrity of Pakistan. Arrest of Kulbhushan Yadev, terrorist of RAW from Balochistan was result of such efforts by Pakistan army. In order to tackle this situation India started propaganda over Balochistan and Gilgit Baltistan. On the other hand India announced to stop CPEC Pak-China trade route at any cost but also started propaganda on the international level as well due to which China had to give Shut Up call to India. In the meanwhile the peaceful freedom movement of Kashmir got momentum in such an order that India has failed to stop it even using her traditional tactics of torture. The Kashmiris got so much violent that they hoist Pakistani flags in their protests. India also crossed all limits of torture, from elderly to infants were targeted by shotgun. When the deaths raised in the Kashmir India had to face criticism on the international level; what Pakistan’ Army Chief has to do with it. Repeated Indian interference in Pakistan via Afghanistan, no check and security clearance of thousands of daily crossers from Chaman and Turkham border were such gaps which were being exploited by terrorists. Pak army decided to install gates on the border crossing and impose border management; Indian and Afghan security agencies got hurt over it. Despite of unprovoked firing by Afghanistan on Pakistani forces and martyrdom of Major Changezi along with seven other soldiers, Pak army continued construction work over border crossing gate and border management. This is not possible that such acts does not have approval of Prime Minister, govt. If Pakistani parliament or any one has no objection over it than India has no right to criticize Chief of Pakistan army. 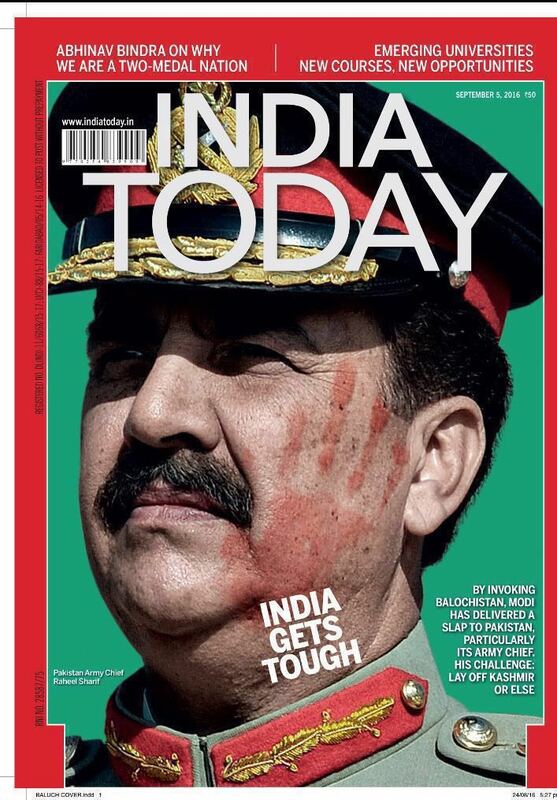 India has played the game of terrorism and blood in Pakistan directly and via Afghanistan but now enough is enough.